Windows 8 sales are still disappointing, but at least third-party developers are continuing to improve our user experience. Sales of Windows 8 continue to disappoint Microsoft: a tiny 0.4-percent increase in its desktop market share during February 2013 (moving from 2.26 to 2.67 percent) means that the Windows 8 uptake has now fallen behind that of Vista in the same period since its release. Personally, however, I don't think we can put the blame entirely on the operating system. The fact remains that computer sales in general seem to be declining, and it's not hard to imagine why. Long gone are the days when our computers ground to a halt while attempting to run a couple of applications simultaneously, leaving us desperate for a faster model. The majority of mainstream computer users no longer require additional speed, and are probably enticed to a new machine only by looks and new features (which would account for a quoted increase in tablet use of some 50 percent). Recent reports also indicate that television is now the fastest-growing Internet platform, with set-top boxes and Smart TV usage jumping 138 percent during the last six months. And smartphones will allegedly account for 67 percent of Internet-connected devices within five years. Meanwhile, sales of desktop and notebook PCs continue to drop, as businesses carry on using the PCs they have been using for years that are still quite fast enough for their requirements (a March 2012 report indicated that 79 percent of business desktop machines were still running Windows XP). When support for Windows XP with Service Pack 3 finishes on April 8th 2014, some businesses may be forced to update their operating systems, but even then, touch-screens are unlikely to be on their list of desirable features! With a slick interface and very informative visual options, the Resonic Player is freeware of the highest order! Most of us have hundreds, if not thousands, of samples and music files stashed away on our hard drives, but Windows doesn't make it particularly easy to audition them. If you double-click on a WAV, AIFF or MP3 file it will, by default, launch Media Player, and of course if you Shift-click a batch of files you can play one after the other. However, if you want to quickly browse back and forth through loads of audio files across multiple folders, then a dedicated audio player/browser utility is a must. I've used quite a few over the years, and still love the browsing features of Extreme Sample Converter, which I reviewed in SOS June 2010, but another that recently grabbed my attention is the Resonic Player (http://resonic.at/). Designed to be ultra-fast, it's currently free for personal use (although donations to fund further development are always welcome) and the tiny 3MB download is available in both installer and portable versions; the latter is suitable for USB sticks, so you can carry the utility around with you. 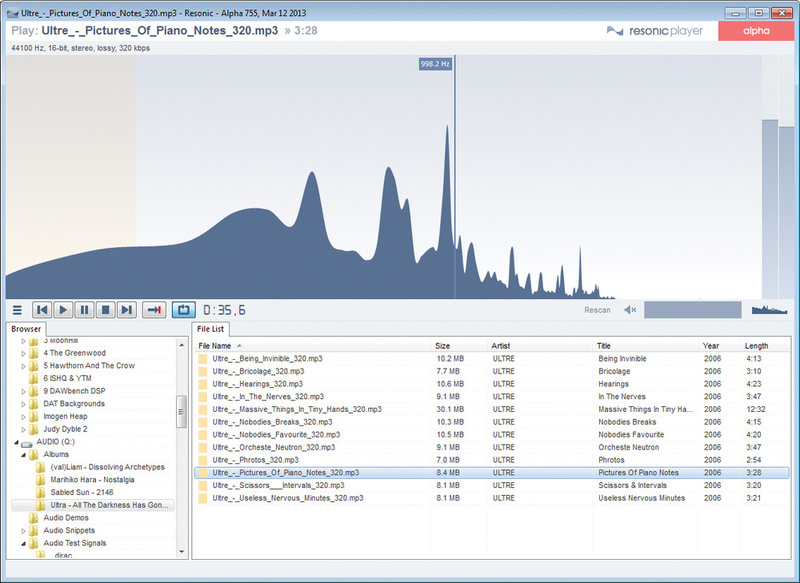 Running on Windows 7, 8, XP and Vista (32 & 64-bit), Resonic Player is based around a visual display across the top with a browser beneath displaying folders in its left-hand panel and recognised audio files on the right (which include WAV and AIFF up to 64-bit, floating-point, as well as a host of other lossless and compressed formats). Nothing out of the ordinary here, except that the visual display offers high-resolution logarithmic and linear spectrum analysis options, as well as the normal waveform view. While waveforms are ideal for anticipating the rhythmic nature of an audio file, the log spectrum analysis, in particular, is perfect for seeing whether certain samples would fit into an existing mix, spotting subsonic rubbish or studying the spectral balance of commercial tracks. Wven the waveform option automatically displays mono, stereo or multi-channel files, while the note event option is perfect for auditioning multitrack MOD (Tracker) files. A moving cursor handily displays playback progress for all visual modes, while the associated transport bar offers a few more unusual options. For instance, file playback in sequential order is ideal for auditioning your way through folders full of audio files, and of course for listening to MP3/Flac albums, while with random playback order I rediscovered quite a few files that I'd forgotten about. The sample looping option also works seamlessly right down to single-cycle waveforms, making it a great tool for anyone exploring new hardware/software synth sounds. After a year of development Resonic Player is already a slick and very useful utility, with a host of keyboard shortcuts to streamline the user experience, and with new builds being released every few days. Austrian developer Thomas Wolf (aka Liqube Audio) also offers an incredibly proactive response to user requests, and deserves our support, especially since a Resonic Pro version is already under way for future release that could incorporate your suggested features. The only one I've missed thus far is the ability to grab loop markers from WAV/AIFF files for auditioning purposes, but apparently this is already in the works, so watch this space! This first glimpse of Windows Blue (Microsoft's rumoured next operating system) displays some of the latest Start screen customisations. After an early build of Windows Blue (Microsoft's next operating system) was leaked online, it seems we can look forward to lots more Start screen customisation, split-screen app positioning with up to four apps in portrait mode side by side, and Internet Explorer 11. The Metro Control Panel is having lots of features added to it, presumably so that even fewer users have to switch to the desktop Control Panel. Does this herald the demise of the desktop? 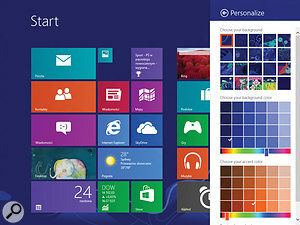 We shall see in due course, but Windows Blue may yet turn out to be a glorified service/feature pack for Windows 8!